As the economy recovers, the stock market has soared. And you--you're looking for profitable places to put your money. Well, search no further! The stocks listed in previous editions of this book have consistently beaten the market average by more than 6 percent. Whether you're a first-time stock buyer or an experienced trader, this quick-reference volume remains your essential and trusted tool for building your investment portfolio. Peter Sander (Granite Bay, CA) is the author of seventeen books and numerous articles dealing with investment strategies. 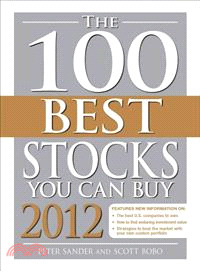 He is the co-author of The Best 100 Stocks You Can Buy 2011. Scott Bobo (San Jose, CA) is a professional engineer and researcher in the consumer electronics, personal computer and semiconductor industries. Scott served as lead researcher for the 2010 and 2011 editions of The 100 Best Stocks You Can Buy.